Perfect for dinner for 1. Whether you use it while camping, eating with the parents, or so your mashed potatoes don't touch your cranberries, this Military-issue Mess tray has you covered. 100% stainless steel means it is easy to clean, but is also incredibly durable and sturdy for a lifetime of use. Collectors, we have not forgotten about you. This is a rare find, and it is not required you use it, you could display it for all to see. Whether you eat off it or not, you will know that you have a strong item that will last for a very long time and stay in good condition. 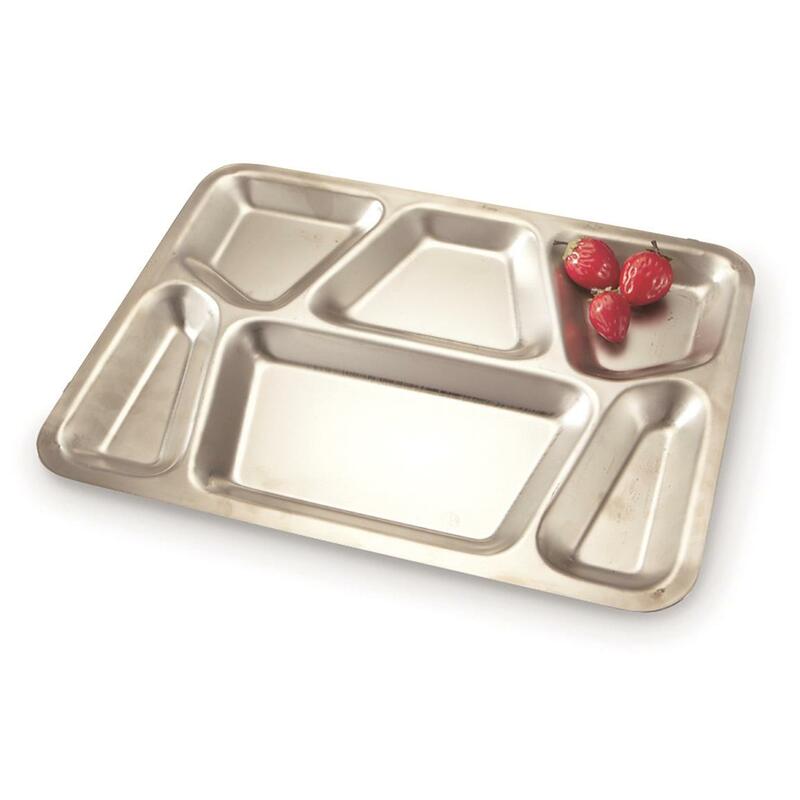 U.S. Military Surplus Stainless Steel 6-Compartment Mess Tray, Like New is rated 3.8 out of 5 by 4. Rated 4 out of 5 by None from As Shown It was as shown, used mess tray, a little ware and in great shape. Rated 5 out of 5 by REMO from I PURCHASED THIS AS A JOKE GIFT FOR MY DAUGHTER! LIKE ME, MY DAUGHTER (NOW 40) LIKES TO EAT HER FOOD ONE ITEM AT A TIME, AND DOES NOT LIKE THE FOOD TO TOUCH ON THE PLATE. I AM SURE THAT SHE WILL USE THIS TRAY ALL THE TIME, IT'S PERFECT FOR A STRANGE EATER LIKE HER. Rated 5 out of 5 by Harry from Perfect for eating and watching TV. I use this tray when I'm feeling lazy and just want to have a quick meal in front of the TV after a long day at work.